These blog posts are taken directly from my notebooks. They contain much of the material that went into the final version of the surprise bestseller Paris to the Pyrenees: A Skeptic Pilgrim Walks the Way of Saint James. Part adventure story, part cultural history my book explores the phenomenon of pilgrimage along the centuries-old Way of Saint James in France—not in Spain. Starting in Paris then training to Northern Burgundy we trekked 750 miles south, an eccentric route taking 72 days on Roman roads and pilgrimage paths—a 1,100-year-old network of trails leading to the sanctuary of Saint James the Greater. It is best known as El Camino de Santiago de Compostela—“The Way” for short. The book includes 32 pages of evocative color photographs by Alison Harris. She has generously provided the images that appear with these posts. What follows is unexpurgated, unedited material—the uncut version. Orpheus pioneered the tradition and Dante perfected it. Our quest began with a descent into the underworld. The Paris métro isn’t Hades or l’Inferno though it can be hellish at rush hour. Happily as we boarded the subway train at Saint Paul station we were all but alone. It was Saturday morning, April 15, at 6:17 a.m. My talking pedometer told us so, and also indicated that we’d walked 0.24 miles from our apartment to the station. The odometer omitted to mention the darkness of the hour and the drizzle falling over a cool, wintry Paris. While changing métros at the Gare de Lyon train station we bounced along the quarter-mile of underground tunnels linking lines 1 and 14. Our brand-new packs jogged from side to side. An extra, third pack for picnics and water swung in front of me, laden with chocolate bars, energy bars and other bars that weighed like gold. On a tall movie poster fresh glue oozed. The poster had already been torn and sprayed with graffiti by late-night or early-morning revelers. It advertised the latest in a series of movies featuring the invincible, time-traveling Gallic hero Astérix. In this episode the lavishly mustachioed Astérix, wearing his signature horned helmet, took on the Vikings. Perhaps, I reflected, as we galloped down the tunnel, Astérix descended from Methusulah: to defeat Julius Caesar and take on the Vikings he would have to have lived about 900 years. I fumbled for my ticket and fed it through the second bank of turnstyles. A dreamy, watery, imperfect kind of epiphany occurred as the ticket reappeared and the turnstyle sprang open. Was the Astérix poster an omen? We were heading into the heartland of Gaul, the bull’s eye of Burgundy where in real life Caesar and his legions defeated not the comical Astérix but fearless Vercingétorix and his union of Gallic tribes. They were what the French sometimes jokingly, sometimes with uncomfortable seriousness referred to as Nos Ancêtres les Gaulois—our Gallic forebears. The Gallic defeat was about 2,060 years ago, eight centuries before Charlemagne and Roland, nine centuries before the first pilgrim had walked across France and Spain to Saint Jacques de Compostelle, a thousand years before the cathedral-builders had laid the foundations of Cluny, Chartres and Notre-Dame, and 1,200 years before Bernard of Clairvaux, later Saint Bernard, called from a valley below the basilica in Vézelay for a Crusade to reclaim Jerusalem. 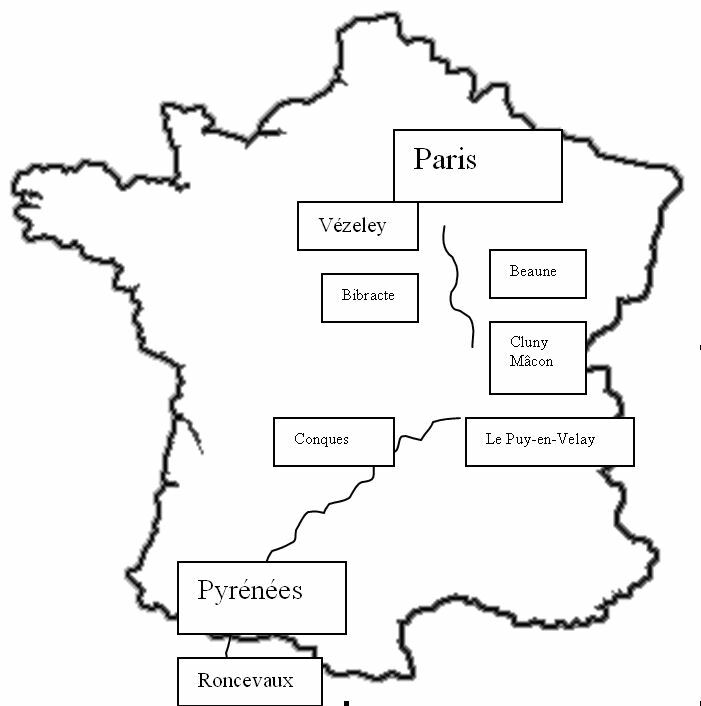 Yet all of them, even the fictional Astérix’s fierce forebears, had walked or ridden down the same roads and trails we were about to set out upon from Vézelay. Météor swooshed into the Gare de Lyon interrupting my reveries. The driver-less express métro deposited us at the Gare de Bercy train station in under two minutes. We were half an hour early for our 7:10 a.m. train to Sermizelles, a stop so obscure that I had trouble finding it on my surveyor’s map of the Vézelay area. Being early was fine by me. Caesar, a pioneer of the forced march, had often crossed metaphorical Rubicons to arrive before the appointed hour. He enjoyed surprising adversaries. Ours wasn’t exactly a forced march, though I had planned our hike with military precision. In theory awaiting us en route were not adversaries in horned helmets but our own doubts, demons and physical limitations. 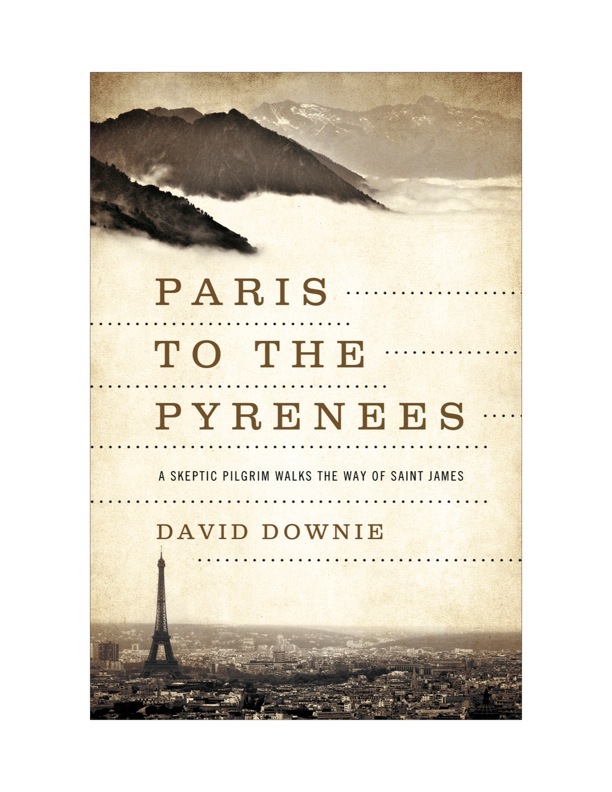 Order the paperback of Paris to the Pyrenees, it comes out in April 2014!